Elsa joined LSBU in March 2011 following a lecturing position at Nottingham Trent University and a six-year postdoctoral research appointment at Imperial College London. A physicist by background, she is interested in implementing state of the art computational methods in solving a variety of multi-physics problems in any discipline and in particular the environment. In addition to her teaching commitments, she is currently carrying out research in modelling air flows and the dispersion of air pollution within the urban environment and working towards a sustainable city environment. She has worked on the EPSRC DAPPLE project and been involved in submission of an FP7 proposal for environmental pollution. 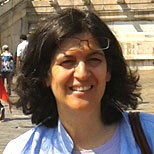 She is currently involved in developing further proposals associated with environmental fluid dynamics. Elsa's research focuses on improving the quality of life of the urban population through predicting air quality using state of the art computational fluid dynamics. The University has access to a state of the art computational fluid dynamics software (FLUIDITY – Imperial College London) for simulating complex turbulent flows at very high resolution and at a range of scales. Through her research position at Imperial, Elsa has also access to the necessary powerful supercomputers for this type of work, which allows the modelling of turbulent complex flow fields as well as the concentration of pollutants. She is currently supervising Masters Projects using FLUIDITY for modelling air pollution dispersal around buildings and also looking at outdoor-indoor pollution transport models. Elsa is a Visiting Researcher at the Applied Modelling and Computation Group (AMCG) led by Prof. Christopher Pain at Imperial College London and three years ago was involved in the submission of an FP7 proposal. She is currently collaborating with Prof. Pain on the submission of a number of proposals for both in the UK and abroad. Aristodemou, E SIMULATING TURBULENT AIR FLOWS IN CENTRAL LONDON AND STUDYING EFFECT OF TALL BUILDINGS. In: 17th International Conference on Harmonisation within Atmospheric Dispersion Modelling for Regulatory Purposes, 9-12 May 2016, Budapest, Hungary.